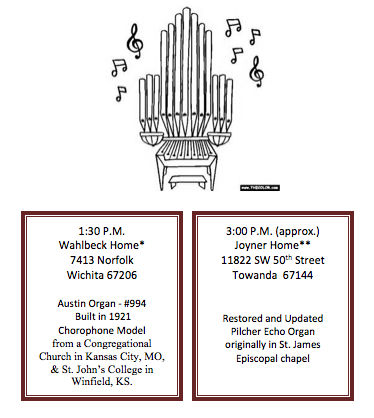 Saturday, October 17, beginning at 1:30 p.m.
Meet at the Wahlbeck home for a demonstration of the organ and a chance to play and ask questions. We will then travel to the Joyner home for another demonstration, performances and refreshments. Free and open to everyone. Please RSVP to Marlene Hallstrom at mhallstrom@cox.net or 316-304-6089 if you plan to attend. From Douglas and Rock intersection. Drive west to the first street coming from the north. Turn right, and drive to the third east-west street, Norfolk Drive.Turn Left on Norfolk. 7413 is the second house on the south side. **Maps to the Joyner home will be available at the Wahlbecks’.